Nothing can stop a shape-shifter from fulfilling his legacy…except a beguiling yet forbidden young woman on a quest to save her sister. There are some boundaries mustangs must never cross–even for true love. Libby wasn’t looking for anything but escape when she took her little sister and fled the malevolent cult they once called family. When a horse appears to carry them from danger, she sees only a ride–and not the horn set in its forehead. Josh knows he wants Libby from the moment their eyes meet. Trouble is, his heritage demands that he claim a virgin bride–or else suffer dark consequences. But he can’t turn away from a female in need, either. 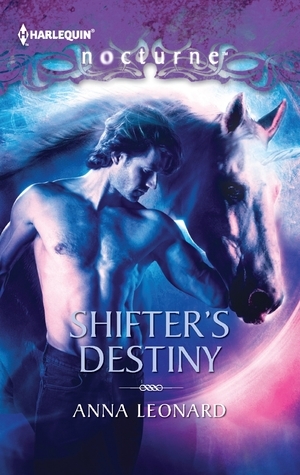 With “The Community” closing in, the unicorn-shifter will have to summon all of his strength to resist Libby’s allure and protect the sisters from harm. He may be no knight in shining armor, but he’s got the hooves to back up his claim. Laura Anne Gilman is an autobuy author for me, so when I discover she had a new Paranormal Romance out under the name of Anna Leonard, I snapped it up. And I am glad I did. I fell in love with this story. The shapeshifting unicorns felt unique, and was a welcome relief from the standard shapeshifters like Werewolves. What I liked was how believable their traits felt. Ms Leonard had included traits from horses, and used them that made total sense, and at the same time added an extra layer of tension.
. That both Maggie and Elizabeth had gifts were obvious, but I liked how different they were. Maggie’s was obvious, but Elizabeth’s gift was more neboulus. The plot sucked me in, and it kept me hooked. The sexual tension between Josh and Elizabeth, the rut, the fear that the villain will catch them… All of it works together to create a tense, fast paced story set against the quaint New England country side. That the plot built up towards an confrontation with the bad guy was clear. But how it happened took me by surprise. It was touching to see how Elizabeth cared for Maggie, and how Maggie loved her in return. Josh was a reluctant hero at first, since he had to return home. Yet, I adored him for the fact that he was there for them when they needed him the most.